Is Handling Responsible for iBook Failures? iCook is a small OS X kernel extension that allows simple overclocking of the IBM 750fx processor found in some Apple iBooks. It should be compatible with all iBooks that have 16 MB or more video RAM, but not the new iBook G4s. At this time iCook requires OS X 10.3 or higher, however this will change in a future version. Apple has made it more difficult to change the iBook's speed. It seems that current versions of OS X continually monitor the CPU speed and set it back to normal if it is changed. iCook gets around this by patching the kernel image in memory to disable it's ability to set the CPU speed. It then sets up a sysctl called hw.cpuspeed that allows the CPU speed to be set and monitored by the user. iCook makes no permanent changes, and everything goes back to normal after a reboot. I am able to run my 700 MHz iBook at speeds from 300-800 MHz, although 800 MHz is not entirely stable. CPU performance scales nicely along this range. iCook allows speed settings from 300-1200 MHz in 50 MHz increments and comes with the full GPL'd source code. Because iCook disables OS X's ability to change the CPU speed, the Processor Performance settings in the Energy Saver System Preferences will not work after the iCook kernel extension has been loaded. The settings become active again after the next reboot. Note: Proceed with experimentation at your own risk. Use of iCook could invalidate your iBook's warranty. "Looking at the iBook I noticed that its frame appeared slightly bent, i.e. when the lid was almost closed, the gap between the front of the screen and the frame was slightly larger on the right side (the side of the power connector). "In my desperation to get access to some files I gently straightened the frame, and to my surprise the iBook started up normally. While this 'cure' did not last for very long it allowed me to move important files to a memory stick. "This raises the question whether Apple has not yet resolved the problems underlying the iBook Logic Board Repair Extension Program. Wasn't this program recent extended to include some newer G3 iBooks? Should we now expect that the G4 iBooks have to be included, too?" "Few technology-related answers are more annoying than 'it depends on what you're going to use it for,' but it's the answer that I invariably give to people when they ask me whether they should buy a laptop or a desktop, whether an iPod is worth its price, or whether they should invest in a SuperDrive. With a laptop, it comes down to two factors: how often you're going to travel with it outside of your home, and how often you're going to want to use it in locations within your home other than your desk. It's not an easy prediction to make if you've never had a laptop before, because in-house mobility is one of those things that you can certainly live without until you finally have it, at which point you'll either just shrug at it or find that you can no longer live without it at all...."
For my take on this issue, see Desktops Aren't Going Away, But 'Books Are Still the Logical Mac on Applelinks. "Apple took a prestigious Silver Award from the D&AD (Design and Art Direction) last night for its PowerBook G4. "The product took a Silver (affectionately known as a 'Yellow Pencil') in the Products for Work or Industry sub-group of the Product Design category." Need RAM? You have a Mac, you need RAM, you live in Canada? Redmac's RAM Wizard is here. Simply choose the amount of RAM you'd like, indicate your model and current amount of RAM, and Redmac will handle the rest. The Redmac.ca product offering is not built from a spreadsheet. If there is an item that you need that they don't have, they would be more than pleased to research and locate a product that meets you needs (even if they can't sell it to you!) If there is a product that you think others should know about, we would also appreciate the feedback! The Macintosh community, especially in Canada, has been built on the sharing of information and recommendations. Continue that tradition. "The notebook, not the desktop, could become the ideal living room PC form-factor if a number of new high-end machines from Asus, Acer and Elitegroup prove to be market leaders. "All three used Computex Taipei this week to demonstrate large-screen, slimline notebooks that are not only styled like consumer electronics hi-fi product - all aluminium, silver paint and black plastic - but are designed to operate as standalone music and video players. "Each machine - Elitegroup's G900, the Asus W1N and Acer's upcoming Aspire 1800 - features a dedicated control panel for playing and pausing discs, skipping backward and forward between different tracks, controlling the volume and so on. "Crucially, each machine's panel operates with the lid closed and without having to boot the computer up first." "With its aluminium shell and low-slung screen-hinge, the W1N is decidedly reminiscent of Apple's 15in PowerBook G5, though there's no slot-loading optical drive, alas, just a plain old drawer-mechanism job." Roxio, Inc. and LaCie have announced the first comprehensive double-layer burning solution for the Mac platform. Effective immediately, Roxio's award winning software, Toast 6 Titanium, will begin shipping with LaCie's new DL DVD+/-RW drive. The LaCie DL DVD+/-RW drive combined with the new DVD+R Double Layer capabilities of Toast 6 Titanium will enable Mac users to burn nearly twice the amount of personal data (from 4.7 GB to 8.5 GB), or record more than three hours of MPEG-2 (DVD quality) video content on a single DVD +R DL disc. In addition to double layer recording capabilities, the new drive will support both DVD-RW and DVD+RW formats at 4x speed, as well as CD-R and CD-RW formats. "LaCie's decision to offer Toast 6 Titanium with their new DL DVD+/-RW drive targeted at the professional and business market is a true testament to the product's technical depth and powerful feature set," said Dave Cornella, Director of OEM Business, Roxio. "We are extremely pleased to be partnering with a company that shares our commitment to product innovation and technical excellence." With the LaCie DL DVD+/-RW drive and Toast 6 Titanium, Macintosh video professionals will have the power and flexibility to create full-length productions without using complicated and expensive DLT (digital linear tape). Additionally, all users will benefit from the ability to back up personal DVDs without having to first compress the dual layer into a single layer, a step which requires additional software and sacrifices video and audio quality. "We fully recognize, as our customers do, that Toast is the standard for CD and DVD burning on the Mac and a brand synonymous with high quality and value," said Salem Tirane, Optical Drive Product Manager, LaCie. "The inclusion of the full, rich capabilities of Toast 6 Titanium with our premier drive ensures our customers' double layer recording experience is uncompromised and rewarding." The LaCie DL DVD+/-RW Drive bundled with Toast 6 Titanium will be available in June 2004 through authorized resellers, specialty stores and mail order partners with prices beginning at $249. Madsonline's SimpleSpeaker is a very small and light stereo loudspeaker which works without batteries. It can be connected directly with the headphone jack of your iPod without using any audio cable. The foldable design of SimpleSpeaker allows it to use the iPod both in horizontal and vertical position. The SimpleSpeaker packs and travels easily and enables to use the iPod even as a travel alarm clock. SimpleSpeaker for iPod sells for$14.95. The Think Different Store has in-stock the iTalk Voice Recorder for iPod. The iTalk retails for $40.00 and is on sale till June 8th for $37.75. This stylish matching accessory snaps directly on top of the iPod and turns it into a fully functional voice recorder and playback device. In addition to it's superior built in microphone and internal speaker; the iTalk has a connector that supports both headphone monitoring and the use of an external microphone. With iTalk connected to an iPod, users can record literally thousands of hours of seminars, meetings, classes, and other events up to 100 feet away. Its built in microphone was designed to record crystal clear audio and provides Automatic Gain Control that assures the best possible signal level. For even higher quality recordings users can connect an external microphone directly to iTalk via a mini-jack connection on top of the unit. The iTalk can play back recordings through its very capable integrated speaker. In fact, it is loud enough to be clearly heard across an office or in a car - making it a great solution for listening to audio books or sharing the playback of an event. But iTalk also includes a pass-through headphone jack that allows monitoring of voice recording, or simply to listen to music without having to remove iTalk from the iPod. Users can also download recordings to their computer for playback or archiving. With looks to match Apple's wildly successful iPod mini, Matias has announced its newest iPod Armor aluminum hard case, the iPod Armor mini. The new case features a rugged and stylish aluminum shell, hard ABS window, docking port access, and iTrip compatibility. 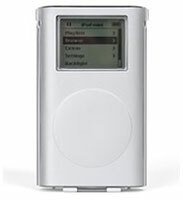 "Based on our original iPod Armor design, iPod Armor mini offers the best protection available for your iPod mini," said Vesna Vojnic, Marketing Manager for Matias. "With the new display window and the addition of iTrip compatibility, the new mini case is even better than the original. It's even better looking." The iPod Armor mini case comes bundled with the Armor Clip belt clip, and retails for $49.95.